The Gold Line Parking Autocashier is your 24/7 Automatic Parking Attendant. The parking version of the GL-ACW, the GL-ACW-P, is an in-lane paystation which is installed at the entrance or exit of a lot or parking garage. It has the ability to accept $ 1 through $ 20 dollar bills as well as quarters, metal tokens and Hamilton's exclusive "Tokenote" paper tokens. Change is returned in quarters from the self-replenishing hopper (a dollar coin option is available). 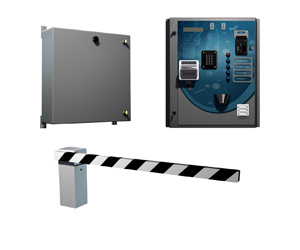 Allied Industrial Supplies Limited gives you the added option to purchase Magnetic Autocontrol or Amano Parking Barrier Gates to complement toe GL-ACW-P Autocashier. Having been completely redesigned electronically, the GL-ACW-P now has the added convenience of a printed receipt dispenser option as well as credit card acceptance. Audit reports may be printed from the receipt printer or faxed daily to a fax machine or PC when the credit card option is installed. Designed for fixed rate situations, the GL-ACW-P has been enhanced with up to 9 programmable parking rates for automatic changes on a daily, weekly, or special event basis. This increase in flexibility provides the opportunity to adjust fees more frequently.